Take a look at how the FastSpring for EDD plugin can drastically improve your WP Themes or Plugins shop, by taking away the burden of taxes and improving the user purchasing experience. Easy Digital Downloads (EDD) is known to be a default WordPress choice for selling digital products online. One of the markets, that EDD is especially popular in, is the WordPress themes and/or plugins shops. Almost any theme or plugin shop uses EDD to display and sell their products, because it’s easy to use and has its own ecosystem of powerful and helpful addons. If you are a theme or plugin author and have you own shop, chances are, that you are using the EDD plugin, but you might not know, what FastSpring is, so let’s look at that first. In very basic terms: FastSpring is a payment gateway, but that description does not give it justice. Focus on growing your business. We’ll handle the rest. The easiest explanation is, that FastSpring will act as your product reseller, taking care of payments, taxes, invoicing, recurring payments (subscriptions), refunds, … and they have multiple payment options, that your clients can choose from (Credit / Debit Card, PayPal, Amazon, …). This way you can truly focus on your business. That’s the way it should be. If you own a business in Europe or if you do business with European clients (which you probably do) and want to comply with all tax regulations, which state that you have to pay the taxes to the country from where your client made the purchase from, then you know, how huge of a relief it is to completely disregard any thoughts about taxes, since they are taken care of by FastSpring. You can sleep better, knowing the tax officials won’t knock on your door, for not complying with their rules, because the taxes are taken care of. It’s an awesome feeling! You also don’t need to worry about invoicing, since FastSpring is selling your product and they handle that as well. No more bureaucracy – double awesome! FastSpring offers a flexible API, which can be used to build integrations with other systems and platforms. There was no integration with WordPress or Easy Digital Downloads and that’s why we created the FastSpring for EDD plugin. FastSpring takes care of the business side (payments, taxes, invoices, …), while EDD takes care of the technical side. With Easy Digital Downloads you can display your digital products (themes and/or plugins) on you WordPress site. Users can purchase these products and EDD will deliver the purchased products to their email inbox. EDD can also create a customer account, by which the users can access their purchases and download purchased products. This is only the very basic thing that the EDD plugin offers. Easy Digital Downloads has a great ecosystem of addons (paid and free), which can improve your site and solve your particular use case. One of these addons is especially great for selling WordPress themes or plugins. The software licensing addon. This addon creates license keys for your products, when purchased and allows you to verify these license keys in your products, making sure, that only the users that purchased the product can use it. And you can also enable one-click theme and plugin updates using the WordPress core updater. How great is that? This is were our plugin FastSpring for EDD comes into play. We have created this plugin, so that you can use the full power of FastSpring in the EDD ecosystem. We are making sure that everything is working OK and that you can focus on your core business, making awesome themes and/or plugins. We have been using this FastSpring integration on our own ProteusThemes shop, where we are selling niche WordPress themes and it’s been working great! Let’s first review, how the default purchase flow of a single digital product looks like on a Easy Digital Downloads shop. When a user clicks on the purchase button, the product is added to the cart. The user has to click on the “checkout” link, which redirects him to the checkout page, where he can review his purchase, add his information and finally confirm the purchase. In EDD you can set a product to a “Buy now” purchase button behavior. This will redirect the user to the checkout page as soon as he clicks the purchase button, which improves the purchasing flow for a single digital product, by a bit. Now we can look at the purchase flow of the single digital product with the FastSpring for EDD plugin. Note: the EDD product is set to “Buy now” option. 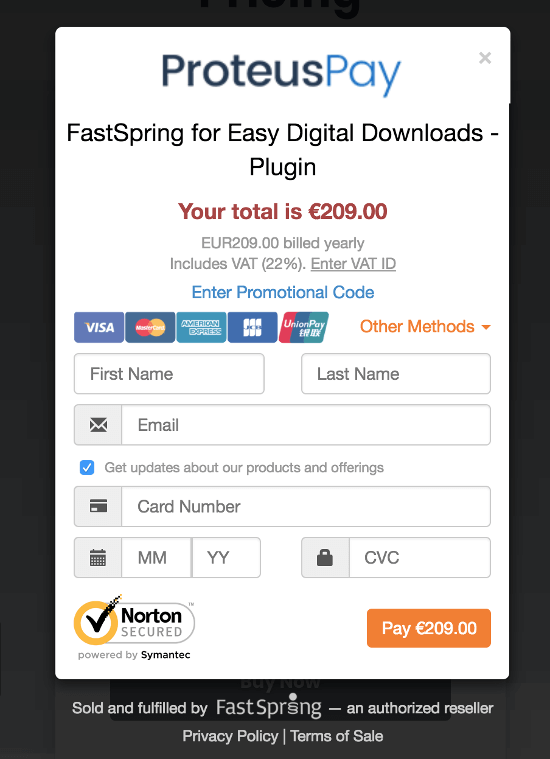 The default plugin option is to use the FastSpring checkout popup, which improves users purchasing experience, because it only consists of one step. When the user clicks on the purchase button the FastSpring checkout popup is displayed on the same page and the user can input his info and confirm the purchase. It’s that easy! You can test it out on our page in the pricing section, just click on the “buy now” button and you will see the FastSpring popup checkout show up. As you can see, we are using our FastSpring for EDD plugin on proteuspay.com as well and it’s working great! Join us in using our plugin for FastSpring integration with EDD for your digital products shop by purchasing the plugin here. If you have any questions about our plugin or FastSpring, then don’t hesitate and contact us!